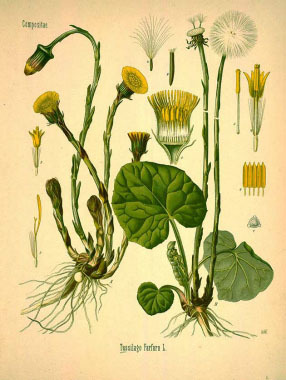 Coltsfoot is a perennial plant that looks similar to a dandelion when it blooms in spring. This wild edible plant is unusual in that the flowers bloom and die before the appearance of any leaves, which earned Coltsfoot the name of "son before the father" in earlier times. Before the introduction of matches, the felt-like covering of the plant, wrapped in a rag and dipped in a solution of saltpetre, was considered to be excellent tinder after being dried in the sun. 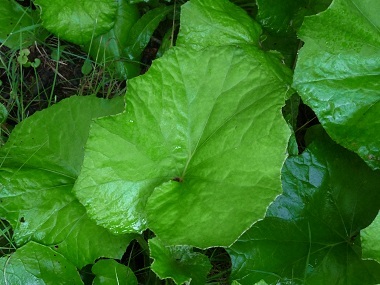 This plant contains mucilage, bitter glycosides, and tannins; it is these that are thought to give the herb anti-inflammatory and antitussive (cough prevention and treatment) properties. Coltsfoot root contains pyrrolizidine alkaloids, potentially toxic constituents and it suspected that there may be small quantities in the leaves. Distinguishing Features: The bright yellow flowers appear early in the spring, prior to the emergence of any leaves. The top of the leaf surface is smooth and almost waxy in appearance, while the underside is covered with white, wool-like hairs. In Southern Ontario, coltsfoot flowers in April, often before the last of the snow melts. Flower heads have even been known to push through snow. 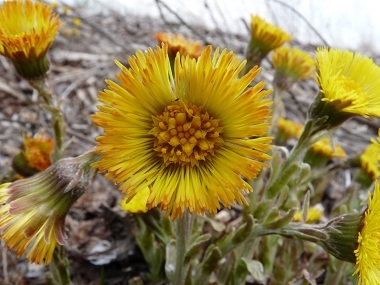 Flowers: Coltsfoot flowers are single, measuring about 1.5 cm (0.6 in.) across surrounded by involucral bracts. Flowers are bright yellow, have ray-florets with tongue-like pistillate flowers in many rows. It has five stamens. This flower is typically the first flower to appear in spring and withers away when the leaves appear. Some people confuse these flowers with dandelion flowers. 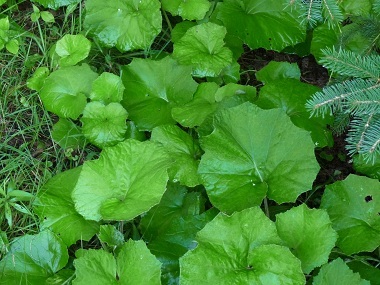 Fields of Nutrition has medicinal benefits and vitamin/mineral content of Coltsfoot. Leaves: The top ‘hoof-shaped’ (colt’s foot-shaped or heart-shaped) leaf surface is smooth and almost waxy in appearance, while the underside is covered with white, wool-like hairs. They can grow from 5 to 25 cm long, and are basal. Height: Average height is between 10 and 15 cm. 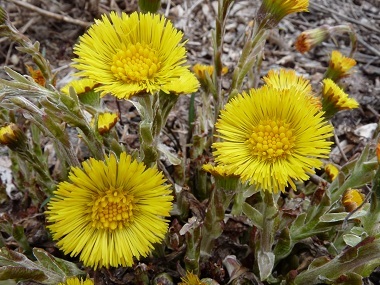 Habitat: Coltsfoot is found in open, disturbed areas. It often grows in ditches, along roadsides, on forest edges and on steep slopes prone to landslides. It tolerates wet, poorly drained areas and riverbanks susceptible to spring flooding. 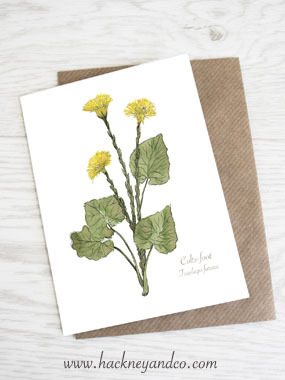 Edible parts: Coltsfoot flowers can be eaten. They can be tossed into salads to add a wonderful aromatic flavour; or fill a jar with the flowers and add honey to make a remedy to help calm a cough or to sweeten a bitter herbal tea. Dried flowers can be dried and chopped up so that they can be added to pancakes, fritters, etc. Young leaves can be added to soups or stews and small quantities of fresh young leaves can be used in salads. The leaves have a bitter taste unless they are washed after being boiled. An aromatic tea is made from the fresh or dried leaves and flowers. The dried and burnt leaves are used as a salt substitute.